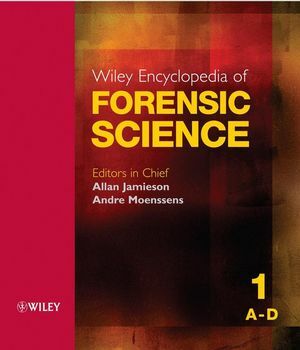 The Encyclopedia of Forensic Sciences provides a comprehensive, definitive, and up to date reference of the main areas of specialist and expert knowledge and skills used by those involved in all aspects of the forensic process, including, but not limited to forensic scientists, doctors, practicing and academic lawyers, para-legals, police, crime scene investigators, analytical chemists, toxicologists, etc. The Encyclopedia of Forensic Sciences covers all areas of specialist and expert knowledge and skill which, either as part of an established forensic discipline or as a potentially useful emerging discipline, are of interest to those involved in the forensic process. This includes both the scientific methodology and the admissibility of evidence. The encyclopedia also includes case studies of landmark cases in the definition and practice of forensic science. The Encyclopedia of Forensic Sciences presents all material on a level and in a style that makes it accessible to a wide range of readers. Lawyers will be able to understand the science behind scientific evidence, scientists will understand the legal aspects, physical scientists will have access to biological and social sciences aspects and vice versa.